Your transmission is a complex component required for your vehicle to run. It’s important to find a talented mechanic when it comes to having your transmission rebuilt. 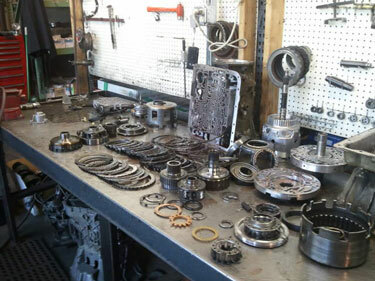 In Vancouver, Washington and the surrounding areas, Ron’s Auto and RV are the leading experts in rebuilt transmissions. What are some signs I might need my transmission rebuilt? Noisy – If your car is sitting idle and you hear loud noises coming from your vehicle, you could need your transmission rebuilt. Leaking fluid – leaking fluid is never a good sign! If you know it’s transmission fluid that is coming out of the vehicle, it’s important to get it right into a shop for transmission repair. Check engine light – An illuminated dashboard is not something you want to see. The check engine light could mean an issue with your transmission or a number of other issues. Ron’s Auto and RV will diagnose your vehicle’s problem at no charge and prior to doing any repairs, we will contact you with a detailed assessment and estimate for repairing your vehicle. Upon your authorization, we will give you an approximate completion date and time, and keep you updated on your vehicle’s repair when necessary.